Every once in a while, I take a picture of something I find humorous or perhaps a little ironic, and I find a way to tie it to the truth found in God's Word, the Bible. Won't you take the journey with me, and perhaps leave a comment or two, as we keep our eyes on the cross? 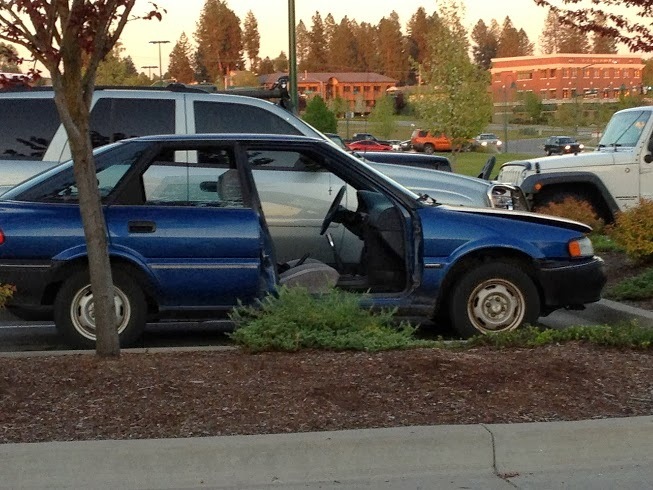 This car, parked at a North Idaho restaurant, certainly gave me pause. Maybe Jeeps look OK without their doors, but a compact looks, well, incomplete. I would feel less than protected, driving a 4-door that only had two doors. Finally, my brethren, be strong in the Lord, and in the power of his might. Put on the whole armour of God, that ye may be able to stand against the wiles of the devil. For we wrestle not against flesh and blood, but against principalities, against powers, against the rulers of the darkness of this world, against spiritual wickedness in high places. Wherefore take unto you the whole armour of God, that ye may be able to withstand in the evil day, and having done all, to stand. Stand therefore, having your loins girt about with truth, and having on the breastplate of righteousness; And your feet shod with the preparation of the gospel of peace; Above all, taking the shield of faith, wherewith ye shall be able to quench all the fiery darts of the wicked. And take the helmet of salvation, and the sword of the Spirit, which is the word of God (Eph. 6:10-17). I am firmly grounded in the Rock of our Salvation, Jesus Christ, and blogging is a great outlet for my spiritual ruminations. However, as I constantly struggle with juggling priorities (it gets hard if you have more than one) blogging keeps slipping toward the bottom.